This is one of the biggest and most obvious examples of a small habit you can use around the house in order to save energy and save money. Many of us make the mistake of believing that a plug doesn’t use any power when it’s turned on, but actually if it’s plugged into any chargers or devices with LEDs or rechargeable batteries, then there’s a good chance that it will. 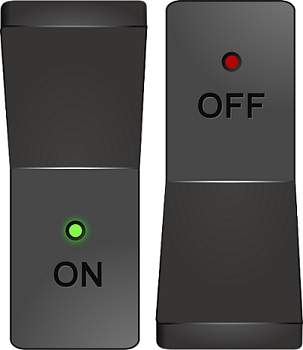 Rather than thinking about which sockets are safe to leave on and which are not, a much safer habit to get into would be simply to switch off any sockets before you go to bed or whenever you leave the house. Or just whenever you’re not using them really! The same goes for lights. If you’re not in a room – then turn off the light! Many of us will walk around from room to room leaving every light on as we go, and while each bulb won’t use that much energy, all in all it can add up to a lot of energy wasted. Taking a bath? Then run the cold water first and then add the hot water second. The reason this is such a great energy saver is that standing hot water will evaporate and create steam – i.e. wasted energy and water. Run the cold water first and you’ll thus need to add less hot water to achieve the same temperature when you get in. Next time you fill your kettle, don’t carry the kettle to the sink. Instead, fill your mug with water, then pour it into the kettle and hit boil. This will ensure you aren’t boiling more water than necessary and that will save energy (and get you your tea faster!). When buying things for your home, make it a habit to look at least three different options before hand to make sure you’re getting the best item. And when you do, look at the energy efficiency rating of each item in particular. This is crucial for any kind of device whether it’s a fridge or a kettle – but it’s even more important for something big like a well water system. So there you go, some very easy habits that will nevertheless save you a lot of energy. The devil is in the details!